2. The system of rituals, practices, and behaviors engaged in by Dogtologists. Chew on this. As humans, we have a deep need to believe . . . a need to relate to something greater and more ideal than ourselves. Perhaps that's why so many millions believe in Dog. Man's devotion to Dog has come to rival the great -isms and -ologies of the world. This has gone way beyond a hobby. We may not literally worship Dogs, but we come pawfully close. This rabid reverence for Rover has a name: It's called Dogtology. Dogtology is for the dog lover who has bailed on a date because they didn't want Twinkles to be left home alone, for the human whose dog owns a more festive holiday wardrobe than they do, those whose pups dine on free-range bison burgers while they live off ramen, or whose smartphones have more photos of their dog than of the humans in their family. Live. Bark. Believe. 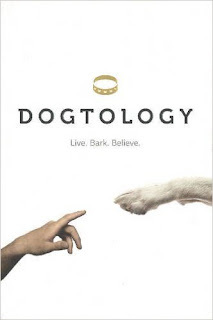 Dogtology is a humorous exploration of man's fanatical devotion to Dog. In this book, Lazarus makes the case that Dogtology has become a bone-a-fide belief system on par with the world's great philosophies and religions. Love dogs? So do I and I love this book! This is a wonderful book for dog lovers with beautiful illustrations. At just 192 pages it is a quick read and you’ll find yourself easily flipping through the pages. Author Jeff Lazarus has a great way with words in this book. If you’re a dog owner, you’ll also find yourself nodding, smiling and agreeing at the author’s written words here. I am proud to call myself a dogtologist and after you read this book, you will be proud to call yourself one, too. Overall, I highly recommend this book without hesitation to anyone that loves dogs, owns dogs or is just curious about the relationship between dogs and their owners. Hands down: I love this book! Live. Bark. Believe, and do it all over again.